Burrard Landing spans the perimeter of Vancouver’s Convention Centre West along the world famous Seawall. Approximately 380 meters west of Waterfront Station on Waterfront Road off Cordova Street. On the Bus – A short walk from numerous stops in downtown Vancouver. Click here to visit translink.bc.ca and plan your trip. Click on the Burrard Landing icon in the Google map, above, then click on ‘directions’ to plan your route. 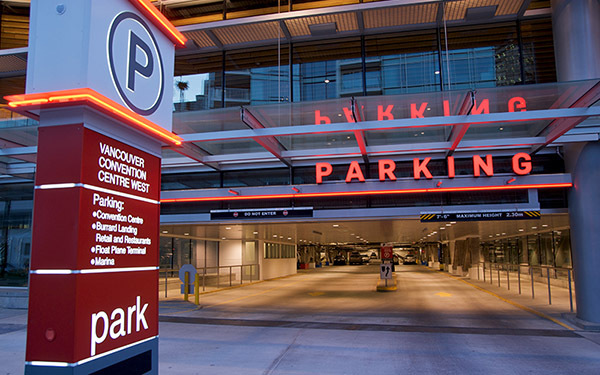 Burrard Landing features ample on-site covered parking at street level, accessible off Waterfront Road. 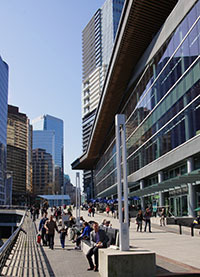 The parkade entry is located mid-block on the north side of Canada Place Road (Waterfront Road West), just west of the Burrard Street intersection. For the latest rates, visit the Impark website.